Yahoo Mail is getting its biggest redesign since 2005 to make it a message hub for its 279 million users. At the centre of the revamp is a plan to make the communications system much more compatible with social media. This means users can post updates to Facebook and Twitter without ever leaving Yahoo Mail. Texting and sending instant messages has been updated. 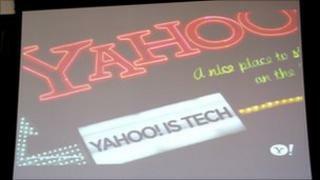 Yahoo said the service will be twice as fast as Google's Gmail and Microsoft's Hotmail. Users will also be able to view photos and videos from Flickr, Picasa and YouTube inside their e-mail inbox. "People spend more than 30 billion minutes a month on Yahoo Mail," Dave McDowell, Yahoo Mail senior product director told BBC News. "It is a critically important product to our users and this represents [the] most significant upgrade to Yahoo mail in five years." Other upgrades to Yahoo's service include improved spam filtering, and tools to search through mail that will help better sort and prioritise messages. By revamping its mail system, Yahoo is mirroring refreshes already pushed through by rivals. Google introduced its priority inbox feature at the end of the summer to help users grade e-mail into four categories. Meanwhile Microsoft updated its Hotmail e-mail system in a similar fashion to help people organise messages better. The Yahoo Mail refresh had been touted back in September as part of an overall product strategy to show the company remains relevant amid increased competition from Google, Microsoft and Facebook. Last week the early internet pioneer posted mixed financial results, increasing pressure on executives to turn the company around. Industry analyst Greg Sterling, of Sterling Market Intelligence, said the upgrades to Yahoo mail are important in showing the firm still has products that can compete. "Yahoo Mail is a critical product for the company with an enormous user base," he said. "The challenge for them is to make having a Yahoo Mail address cool." "It has lost some of its chic or cachet to GMail among early adopters or the tech savvy so there is a brand issue there," he added. "In the past I would have said people don't want all these functions in their e-mail box but with people now having so many sites to visit this makes sense," said Mr Sterling. "I think if Yahoo Mail performs well, they will win people over," he said.